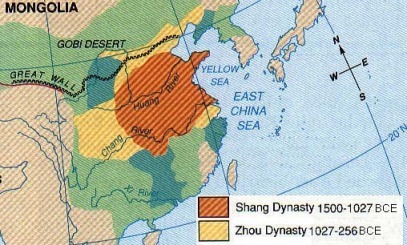 The Zhou Dynasty: 1050 - 400 B.C. Location: The Zhou Dynasty was originally located to the west of the Shang dynasty but after the defeat of the Shang, the borders were extended as far south as the Chang Jiang River and east to the Yellow Sea. - compass invented sometime between 480 - 221 B.C. The most significant achievement of the Zhou Dynasty was the development of the Chinese philosophies, including Confucianism, Daoism, and Legalism. This occurred during late 500 and early 400 B.C. The Chinese philosophers emerged during a period in the Zhou Dynasty when there was political anarchy and social turmoil. The philosophers were men with their learning and ideas for reuniting the empire and restoring order to society. Confucianism was the idea that people should behave ethically and have great respect and commitment for their families. This would result in a better society. Daoism was the belief in the dao "way" that creates the world and how things should live. If people follow the Dao, they would live in peace and find contentment. Legalism believed that people were evil by nature and needed strict rules and punishment to control their conduct.